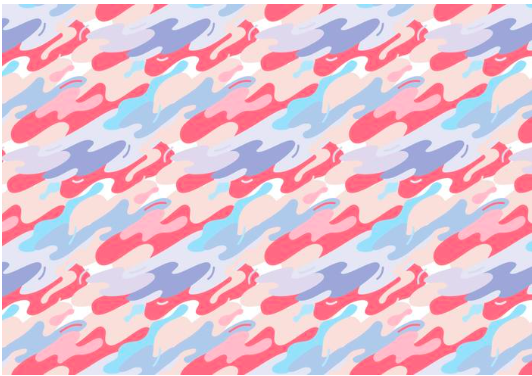 I found this pattern on Vecteezy and it immediately caught my attention for multiple reasons. The pattern is a conglomerate of what appear to be simple blobs. The combination of curves creates a fluid look like something is melting. The melting effect is intensified by the colors portrayed in this image. There are two different groups of colors that complement each other in this pattern: a group of red hues and a group of blue hues. There are about 3 analogous shades of red and about 3 analogous shades of blue, all varying in value and saturation. When the group of red hues are together they create a subtle gradient as your eyes go over them which helps give off the illusion of melting and helps you visualize what it would look like if there was motion in the image. The same goes for when there are groups of blue blobs. When I take the entire pattern in, the red hues stand out to me the most because of the high level of contrast between the darkest red and the darkest blue. While some of the colors are more saturated than others in this pattern, collectively they are not a highly saturated selection of colors; in fact they’re fairly pale. Both groups of hues in this pattern are polar opposites when it comes to temperature, since blue feels cool and red feels warm, but also since the colors have very low saturation it makes the entire pattern look cool. This entry was posted in Color Interaction. Bookmark the permalink.